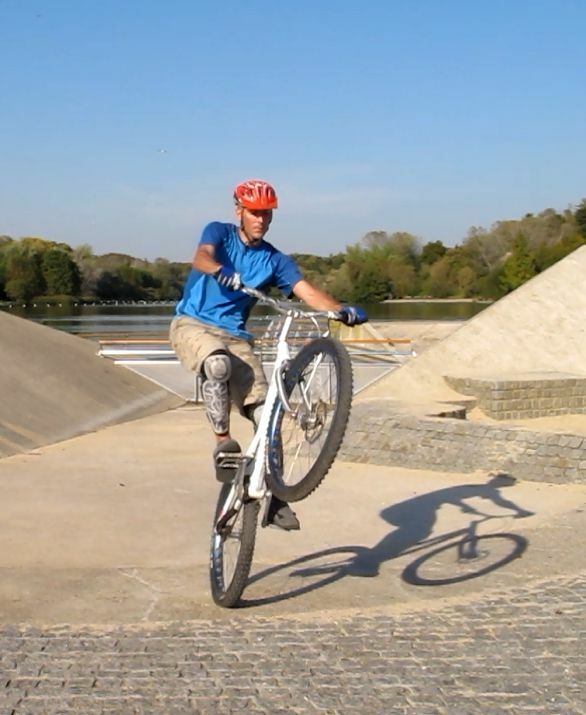 A classic for urban riders, wheelies are just a fun way to improve your overall balancing skills. Mastering the wheelie is essential as a shortcut for smooth transitions, riding off an edge or to accelerate before a rolling pedal-kick. Maintain your lateral balance with your hips. Riding slowly, drive a quarter of a crank turn with your front foot while crouching slightly to push-up on the bars and compress the front tyre. Then thrust your hips backwards and accelerate on your lazy foot for the next quarter turn. You should lift the front wheel as you push on your lazy foot. Keep your centre of gravity at the vertical of the rear hub, arms fully stretched. Pull back your shoulders as far as possible with your arms extended and just carry on pedalling smoothly while reaching balance over the rear wheel. Keep your knees loose, carry on pedalling slowly and feather the rear brake if you tend to accelerate too much, this will prevent you from falling on your back. Ideally, you should find a point of balance where you just keep the bike rolling without accelerating. Adjust your balance with your hips. 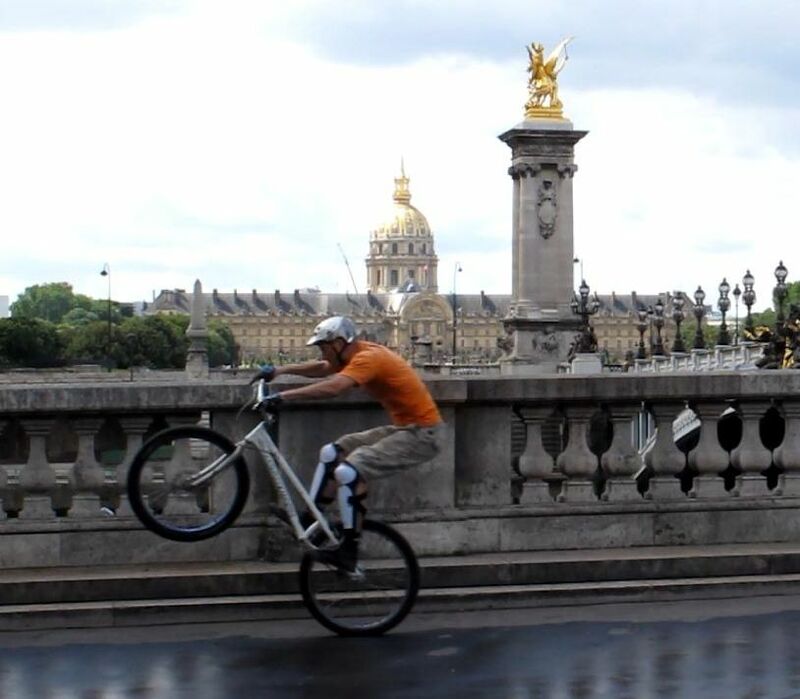 If you have a regular bike with a seat, it is often easier to learn the wheelie seated. 1° Riding slowly, drive a quarter of a crank turn with your front foot while crouching slightly to push-up on the bars. 2° Then thrust your hips backwards and accelerate on your lazy foot for the next quarter turn to lift up the front wheel. 3° Keep your centre of gravity at the vertical of the rear hub, arms fully stretched. Pull back your shoulders as far as possible. 4° Keep your knees loose, carry on pedalling slowly and feather the rear brake if you tend to accelerate too much. 5° Ideally, you should find a point of balance where you just keep the bike rolling without accelerating. 6° Adjust your lateral balance with your hips and try to maintain the same pace. Control your pace until you can stop. 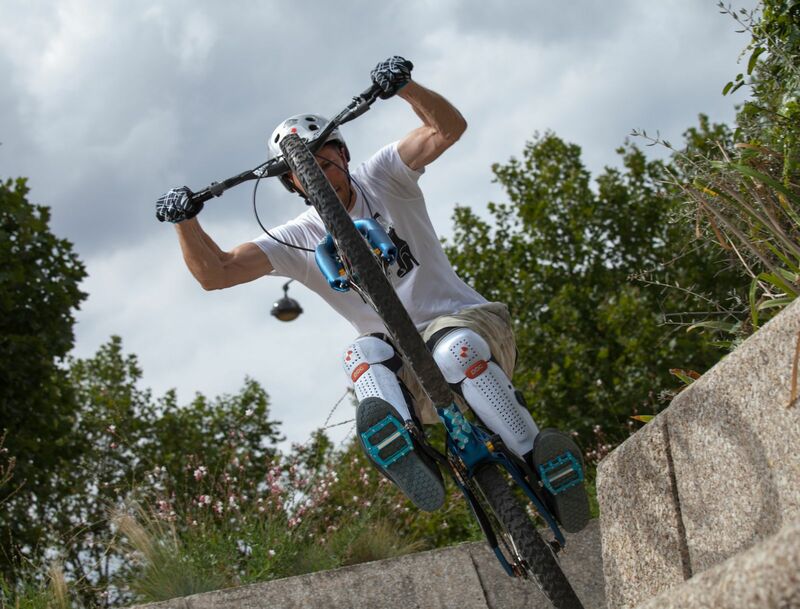 It is easier to learn the wheelie going up a very mild slope, the front wheel is easier to lift and the natural uphill resistance allows for better pedal control without succumbing to an uncontrolled acceleration. This also prevents the bike from shooting beneath you. Once you get the feel for it, improve your braking control, either on a flat or down a mild slope. Tune your vertical balance by hovering over the rear hub. Often, the front wheel tends to drop down when riders don't lean back enough. 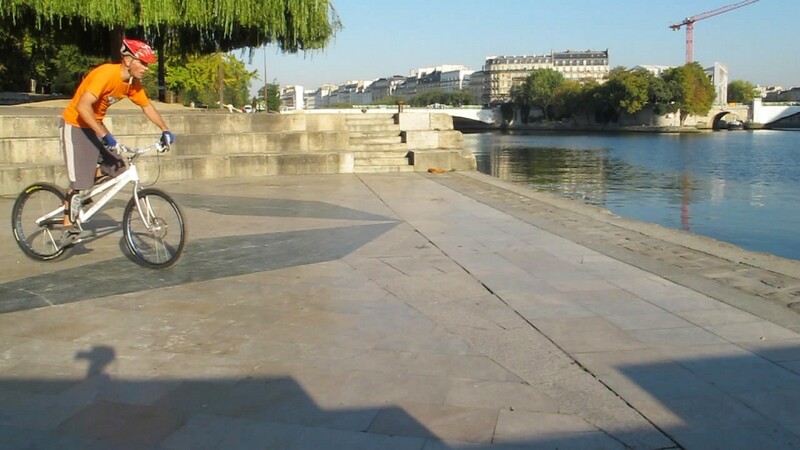 For those bikes equipped with a seat, the point of balance should feel exactly the same sitting on your bike, as if you were balancing on a dining chair, on two legs only. When the front wheel drops, a slight pedal acceleration or adjusting your shoulders and hips further back should bring you back into perfect balance. 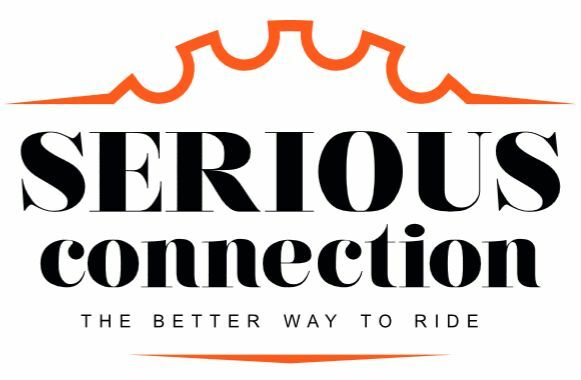 If you tend to fall backward, either crouch and lean forward while flexing your arms and tucking your knees on each side of the frame, or feather the rear brake to force the bike down and keep your balance. The mistake of most beginners is to perform wheelies in constant acceleration instead of focusing on balance and controlled pedal input. Once the front wheel is up, use your knees and hips to keep going straight and compensate for any sideways deviations. For example, if you fall on your left, pull your right knee on the outside, and if necessary, swing your hips aside too. Keep your knees more or less open to achieve perfect lateral control. Start at a low speed and try not to accelerate to maintain a constant speed. Eventually, you will be able to ride slowly, slow down to a full stop and start again while balancing on the rear wheel. It really takes some practice but it is worth the feeling.